Applicable glasses: standard myopic、optical、reading glasses (medium or small size frame); part of the rough frame glasses may be applied. Does not apply for all sunglasses、swimming goggles、basketball goggles or other sport goggles. Before buying,please determine the size of the glasses frame.
. If this size of glass case don't fit your eyeglasses,please return it free. 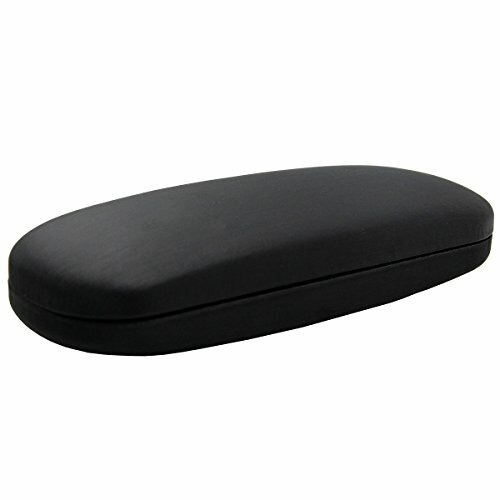 Durable: The hard shell of the Glasses Case is made to not only carry your eyewear, but to protect it from scrapes on the lenses and damages to the frame. The durable case has a comfortable finish on the exterior and soft protective lining on the interior to prevent glasses from being scratched and dirtied. The case is substantial and protective, but lightweight enough to carry with ease. This case fits most frames - both kids and adults.Case fits standard sized eyeglasses.Streamlined design allows the case to slip into your pocket or bag, making it easy to store and retrieve your eyewear. Spacious interior makes the case a multipurpose storage tool for small electronics, accessories, or other small items. Great present:Because of the great use that everyone can get out of this product, it is a perfect gift for men, women, and children. Featured in many colors, it can suit whoever you choose to gift it to, making this the perfect unisex present.